Enhance any room with sun beams and luscious greens, and brighten someones day with this brilliant version of traditional dozen roses. 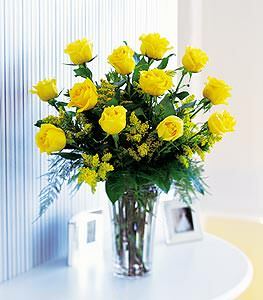 Twelve yellow roses with solidago and myrtle arrive in a classic clear vase. Thank you for your prompt service. My mother loved her flowers yesterday. I am very happy with the service.